In 3rd grade, your child will gain a firm foundation in the four basic math operations (addition, subtraction, multiplication and division). Help your child better understand these foundational math skills by incorporating fun activities and puzzles into your next practice session. Students in 3rd grade develop an understanding of how to multiply and divide within 100. Students also learn to fluently add and subtract within 1,000. Additionally, 3rd graders are introduced to fractions. 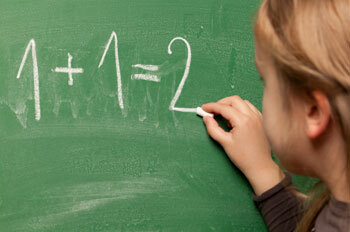 Your child will likely compare unit fractions, such as 1/3 and 1/8. Finally, 3rd graders calculate the area of 2-dimensional shapes using the formula A = l x w, in which 'A' stands for area, 'l' is length and 'w' is width. With this riddle game, your child can practice his or her math and logic skills. Have your child create a 3-digit number based on criteria that you provide. For example, you could ask your child to think of three digits that, when added together, equal a specific number, like 342. Or, as an alternate exercise, you could tell your child that the three digits in the number they create should equal ten when added together. Then he or she could come up with numbers like 118, 451, 640, or 505. Each of these riddles has many possible combinations that will fit the criteria. Because of this, you may want to limit your child to five combinations for each riddle. As an added challenge, you can ask your child to create a combination of digits that, when multiplied together, equals zero. Before beginning this activity, write a variety of numbers on index cards and drop them into a paper bag. Tell your child to select two cards and subtract the numbers on the cards. Your child should set up the subtraction problem by placing the larger number on top. For instance, if the two numbers were 45 and 72, then the problem should look like this: 72 - 45 = 27. As an extension activity, ask your child to use addition to check his or her subtraction answer. For example, in problem 92 - 47 = 45, your child would need to add 45 + 47 = 92 to show that his or her subtraction is correct. 1. There were 26 people in a room. Of the 26 people, 11 of them were wearing socks, seven people were wearing shoes and four people were wearing both. How many people were barefoot? To solve any word problem, your child must first identify the unnecessary information. In this problem, the information that 'four people were wearing both' is irrelevant. Your child should then add the number of people wearing socks (11) with the number wearing shoes (seven): 11 + 7 = 18. Now, your child knows that 18 of the 26 people were wearing either socks, shoes or both. To determine the number of people who were barefoot, your child should subtract 18 from the total number of people: 26 - 18 = 8. The answer is eight people. 2. I have 12 stamps. They are all either 3-cent or 5-cent stamps. All together, the stamps equal $0.40. How many 3-cent stamps do I have? How many 5-cent stamps? To begin solving this problem, your child should use a trial-and-error method. 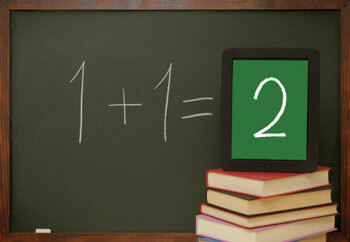 First, list all of the ways you can add two numbers together to get 12, such as 11 + 1, 6 + 6 and 10 + 2. After making this list, your child needs to multiply the addends by the two prices of the stamps. For example, consider 10 + 2 = 12. If you have ten 3-cent stamps and two 5-cent stamps, the multiplication sentence would be 10 x 3 = $0.30 and 2 x 5 = $0.10. Add the two prices to confirm that they equal the total ($0.40). Because $0.30 + $0.10 = $0.40, you know the correct answer is ten 3-cent stamps and two 5-cent stamps.